They come from Brussels, the heart of Europe. They are in their twenties, studying socio-cultural communication. They live in a world without limits, in this privileged Europe of the Schengen area. This autumn, they travelled and met people living at the EU’s external borders. It’s a story a bit extraordinary… A story that could almost not have happened! Just because the people engaged in it were not supposed to meet. The adventure starts on 26 September 2017 for the European Cooperation Day and within the BOZAR initiative “Next Generation, Please!”. The objective is to organise a meeting between Belgian young people, future professionals in communication, with practitioners engaged in cross-border cooperation whose reality at the EU’s external borders is very different from the one that the students know. IHECS, a Brussels-based university specialised in communication, proposes then to include a workshop for 12 students on the topic of cross-border cooperation as part of the cursus of Master 1 in socio-cultural communication. The youngsters will have three months, between October and the end of December to produce an audio-visual tool that will explain ENI CBC to a wider audience. For this purpose, three ENI CBC programmes volunteer and take part to the experience from the very beginning: Latvia-Russia, Poland-Belarus-Ukraine and Italy-Tunisia. The calendar is tight for everybody! In October, students start to prepare themselves and contact their future programme partners to identify people and projects that they would like to film. Assisted by a director of photography, a sound engineer and an IHECS teacher in sociology, the students receive technical trainings while trying to understand the complex topic of ENI CBC. They work on their script, on the images they wish to have, the metaphor they wish to use. They decide that the form of their work will be a documentary. They would like to witness and meet people living in border areas, showing the border as a common space for two countries. Their interest? Nature, and the ENI CBC projects that value this common Nature on both sides of the border for the benefit of people. In November, the students travel. During a week, 12 students and 3 teachers, along with TESIM experts and representatives from ENC CBC programmes will discover human stories at the EU’s external borders. For the programme Latvia-Russia, students start in Riga and take the local bus to cross the Russian border until the city of Pskov. There, they interview people engaged in CBC and professionals from the Center of curative pedagogy, helping children to develop thanks to the Nature. In the south of Latvia, they will meet people working in the project “Nature Therapy”, developing, among other aspects, hypotherapy for children with autism. Russia, Latvia are both united by Nature and its curative prospect. 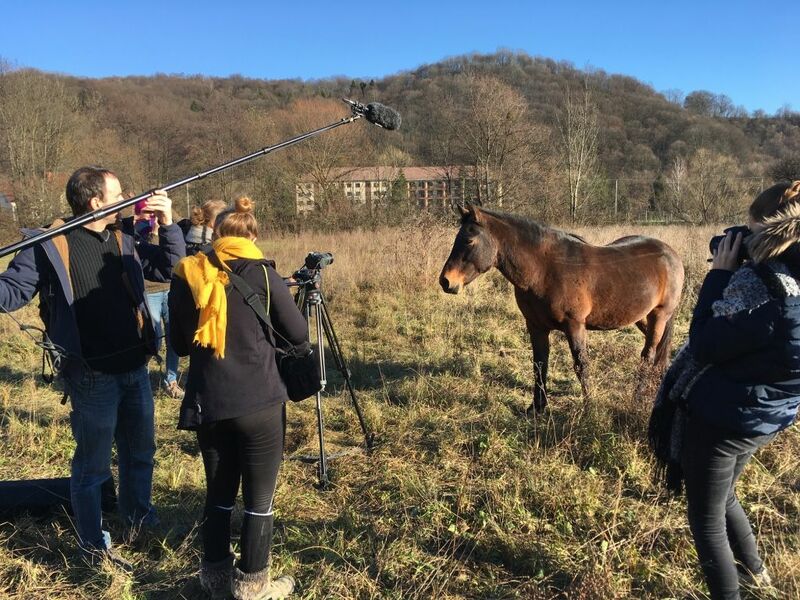 Further south, 4 students travel to Poland and Ukraine to discover the fabulous cross-border story of Hucul horses. These horses, symbols of the Habsburg empire, had practically disappeared after the second world war. It is thanks to the collaboration of the Poles, who helped the Ukrainians to reintroduce these race, heritage of the Carpathians, that the horse will take back its place and its rights. In Tunisia, the adventure is different and the border is maritime. Yet here too, Nature and heritage unite people. Students discover the neighbourhood “la petite Sicile” which shows a lot about the relations and history between Sicily and Tunisia. Students are also visiting fishermen, markets and understand how Tunisian and Sicilian partners try to preserve together their precious maritime resources. “I have learned in one week at least as much as in three years of university” says one of the students, during her trip. When they return, the students do not look at the EU’s external borders with the same eye. Full of questions and images, they are very motivated to communicate these new, unsuspected stories to the people they know and to a wider public. They will work days and nights producing the documentary. On 14 December, the students present the initial version of their work. DG NEAR, TESIM and the IHECS professors are there to discuss and exchange on the result presented. If the adventure is extraordinary, everyone recognises that it does not lack paradoxes. Students question themselves about these “EU’s external borders”and everything that is taking place there. They are well aware that the angle chosen in the documentary is a testimony of people stories who live at these borders and the links that unite them through History. They unanimously recognise that before this workshop, before these travels, they would have never imagined that the EU’s external borders could reveal these positive and human stories, where people simply collaborate. Yet they are not less critical about the fact that these EU’s external borders are closing a little more everyday. These are young citizens, aware ones, questioning their role of future professionals. Another perspective, another reality, that they will expose with their questions during the festival “Next Generation, Please!” in BOZAR from 9 until 13 May 2018. Be there to meet them!